I’m obsessed with sprouts and write about them a lot, like all the health benefits of them in this post. 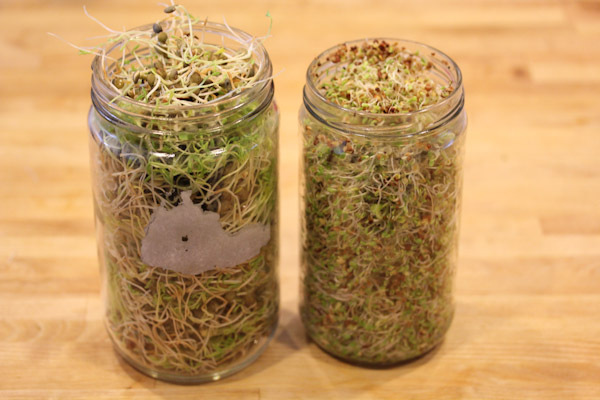 I try to always have fresh sprouts in the fridge, but that’s not always easy with my work schedule and sprouters requiring rinsing twice a day. 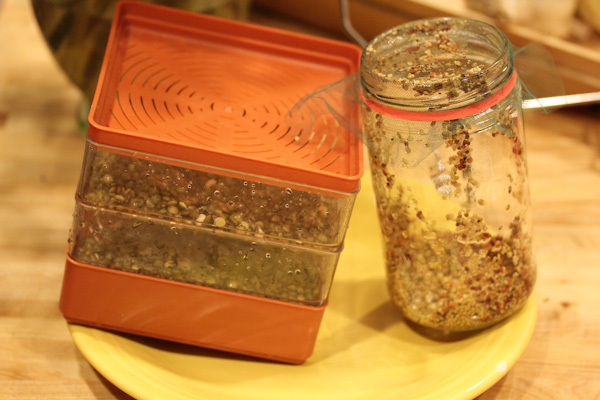 Most seeds need to be soaked for 8 hours before being put into a sprouter. That does not work for me on busy work nights and I end up soaking them for only 3-4 hours which works fine. Five days ago, I started sprouting 2 tbsp. of alfalfa seeds in a jar and 1/4 cup of lentils in my tray sprouter to have plenty of fresh for this week. 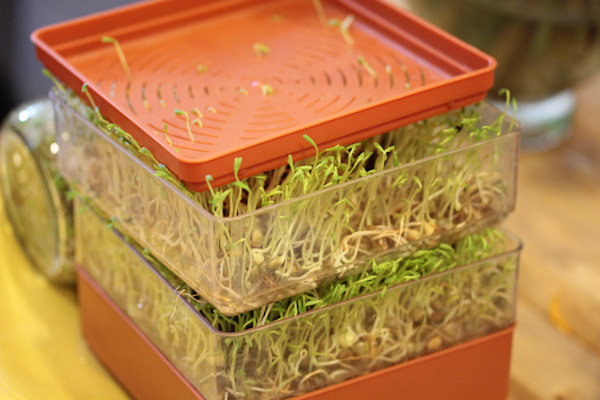 I’ve had better luck sprouting smaller seeds, like alfalfa, in a jar with a rubber banded screen on top than a tray style sprouter, they tend to dry out and not grow in my tray sprouter. But bigger seeds and beans do great in it. On day 2, the lentils are already sprouting. And pretty big by day 4. 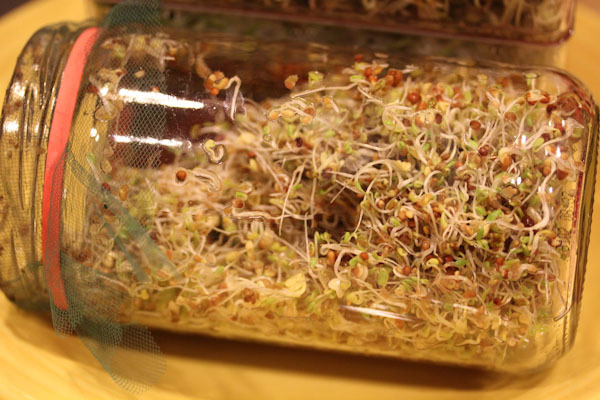 But the alfalfa sprouts took longer, not doing anything the first 24 hours and then started growing like crazy after 2 days. By day 5, the lentils were looking pretty ready. But I like them even longer and let them go another day. By day 6 they were popping through and pushing the trays apart! 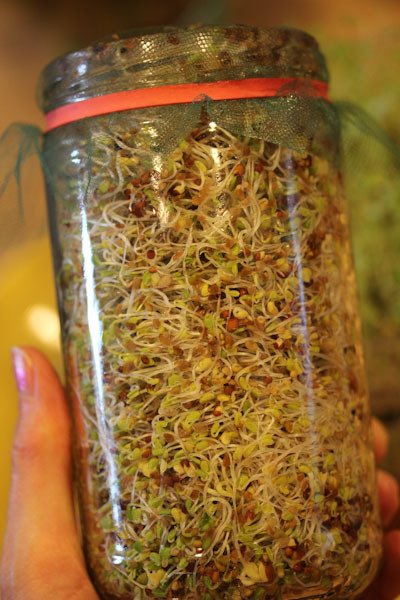 And the alfalfa sprouts were almost overflowing the jar. Time to harvest! I store them in large jars without lids in the fridge, they can breath and stay fresh for up to a week this way and make for easy grabbing for salads and smoothies. 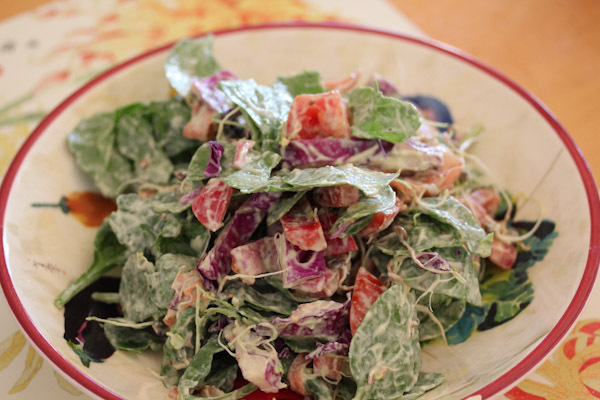 Mmm, like tonight’s dinner salad dressed with Avocado Ginger Dressing. 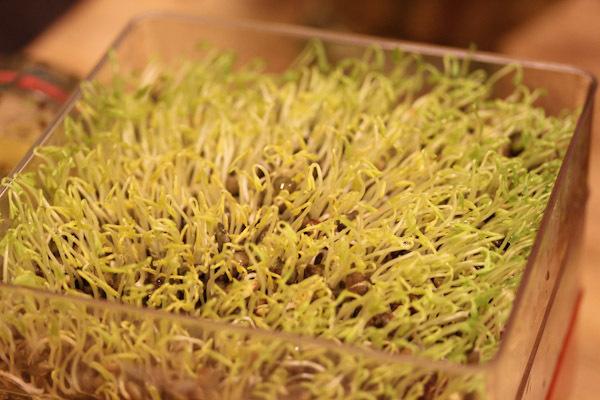 The fresh sprouts add a nice texture and flavor to the salad. 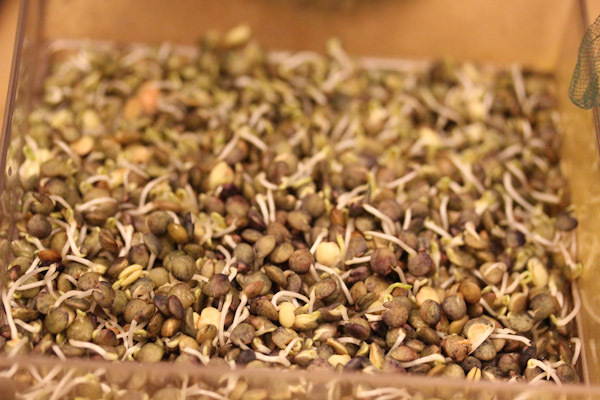 Here’s a list of sproutable seeds and beans, I’ve worked my way through and sprouted lentils, mung beans, buckwheat, and alfalfa are probably my favorites. Sprouted garbanzo beans are probably my least favorite with an odd flavor to me and they’re tougher to grow. Do you sprout? What’s your favorite? YOU are a master sprouter! I went through a phase in the winter when I sprouted. I’m hesitant now, because it’s so hot and humid and I worry about the sprouts turning. 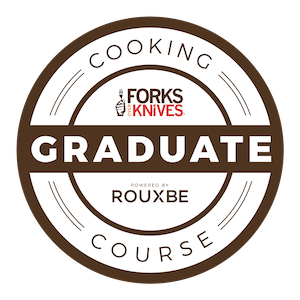 I’ll definitely be back at it in the fall! Awe, thanks. :-) I haven’t had any turn on me yet, just a bad batch of garbanzo beans that wouldn’t grow and had to be chucked. this is so cool! i bet they taste so much better making them yourself :) i like all sprouts. have a great day! They do taste much better and they’re cheaper and last longer in the fridge. 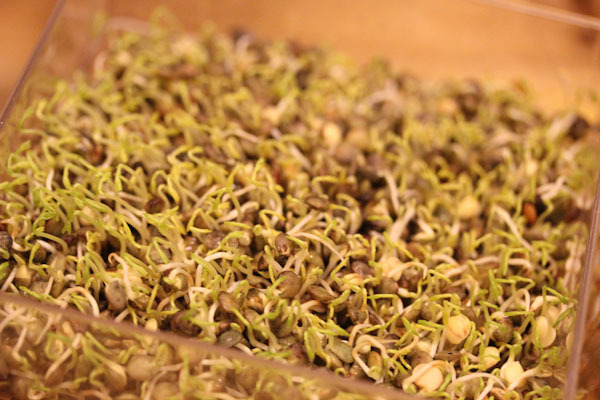 Organic pre-grown sprouts are pricey even at Trader Joe’s! 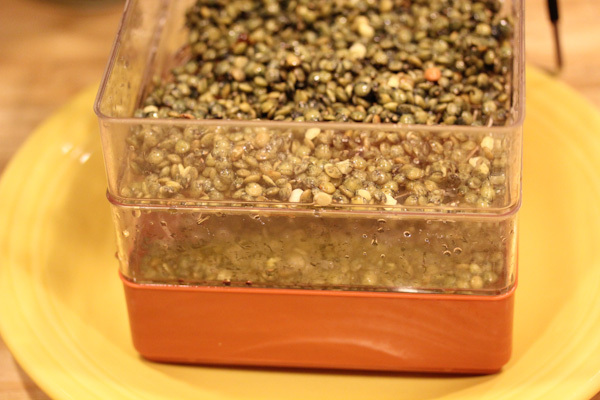 What do you do with sprouted lentils? I sprout chickpeas before making hummus, but it’s really more of an accident. I like to buy the beans dry, then soak them overnight. Inevitably, I can’t get to ’em in time, so I rinse them and place them in the fridge uncovered. By the time I get ready to make hummus, they’re sprouted! I add them to salads and smoothies mainly, sometimes I’ll toss them into a food processor to make a raw pate with.